Abstract Background: The relationship between blood pressure variability and stroke in progression (SIP) in acute ischemic stroke (AIS) or transient ischemic attack (TIA) is still controversial. The aim of this study was to evaluate the impact of blood pressure variability estimated by average real variability on SIP. Method: We prospected enrolled 251 consecutive patients with AIS or TIA (within 7 days after onset). Blood pressure was measured at 2 h intervals throughout the first 24 h, then every 4 h up to the 7th day. Average real variability was used to represent blood pressure variability. Ischemic stroke (IS) patients with an increase of national institutes of health stroke scale â&#x2030;Ľ 3 scores or TIA patients in the event of stroke within 7 days after admission were defined as stroke. Patients were grouped in low and high blood pressure average real variability groups. Results: The incidence rate of SIP was 8.3%. In univariate analysis, high D2-7 systolic blood pressure average real variability, female, and high total cholesterol level were significantly associated with SIP. In multivariate logistic regression analysis, SIP was independently predicted by total cholesterol and high D2-7 systolic blood pressure average real variability. Conclusion: High D2-7 systolic blood pressure average real variability was an independent predictor of SIP in AIS or TIA patients. of BPV for hypertensive patients, previous stroke or TIA patients [16-18], not for acute ischemic stroke (AIS) or TIA patients. Furthermore, various indexes, such as standard deviation (SD), coefficient of variation (CV), variation independent of mean (VIM), weighted standard deviation (wSD), and average real variability (ARV), have been used to evaluate BPV in different researches, but uncertainty remains about which index to assess properly the value of BPV as a risk factor. The aim of this prospective study was to assess the predictive value of BPV estimated by ARV on SIP in AIS or TIA. Tan/Meng/Xing/Zhao/Xu routinely within 24 h after admission. The diagnosis of TIA and IS was based on clinical symptoms and imaging tests according to standardized diagnostic criteria . Inclusion criteria: Patients were chosen (1) whose cases conformed to the diagnostic criteria of the 2005 China cerebrovascular disease prevention and treatment guidelines for IS; (2) whose time of stroke onset was not more than 7 days prior to inclusion. Exclusion criteria: Patients were excluded if they (1) were below 18 years of age; (2) had inadequate BP measurements; (3) had other serious or life-threatening disease before stroke onset; (4) received thrombolytic therapy; (5) previous stroke (modified Rankin Scale score, MRS>2). The research protocol was approved by the medical ethical committee of the First Affiliated Hospital, and inform consent was obtained from every patient. Measurement of blood pressure The casual supine blood pressure (BP) was measured in the non-paralyzed arm using a standard electronic sphygmomanometer (OMROM-HEM-7200) on admission. In the neurological intensive care unit, BP was measured at 2 h intervals during the first 24 h by using a noninvasive BP monitoring device (BeneView T5), and then every 4 h, up to the 7th day after admission by using standard electronic sphygmomanometer (OMROM-HEM-7200) by trained nurse, with 1 h error in the daytime and 2 h error in the nighttime. All BP records were entered manually into the electronic medical record (EMR) system. In addition, we used ARV, which weighted for the time interval between consecutive readings, to represent BPV . It was calculated by the following formula: ARV =|BPK+1-BPK| (k ranges from 1 to n-1 and w is the time interval between BPk and BPk+1. n is the number of blood pressure readings). The BPV during the first 24 h and the 2-7 days (D2-7) was described using systolic blood pressure average real variability (SBP-ARV) and diastolic blood pressure average real variability (DBP-ARV). admission or already under lipid lowering therapy for hyperlipidemia), history of symptomatic ischemic heart disease (proven myocardial infarction, history of angina or existence of multiple lesions on thallium heart isotope screen or evidence of coronary disease on coronary angiography), atrial fibrillation (documented during hospitalization or history of atrial fibrillation), current cigarette smoking, alcohol abuse (>50 g per week), or previous stroke. Assessment of outcome The neurological severity on admission and at 7 days (or at discharge if earlier) was assessed by the National Institutes of Health Stroke Scale (NIHSS) by trained stroke neurologists. The primary outcome of this study was SIP which was defined as an increase of ≥ 3 scores in the NIHSS during the first 7 days after admission for IS patients; and TIA patients during hospitalization in the event of stroke can be diagnosed as SIP. Statistical analysis Data were presented as mean ± SD, median (interquartile range [IQR] for continuous variable), or as the number (%) of subjects for categorical variables. Comparisons of baseline characteristics and BPV parameters between patients of the SIP and Non-SIP (NSIP) groups were conducted with Pearson χ2 test, Mann-Whitney test, or Student t test according to the type of variable. In order to further examine the consistency of ARV in its impact on SIP by different levels. Patients were divided into low (≤ median) and high (>median) groups using the median value of systolic and diastolic ARV during the first 24 h and the 2-7 days. The proportions of patients with SIP were calculated in each group and the relationship between ARV and SIP was assessed using the Pearson χ2 test. All parameters showing significance in the univariate analysis were tested in a multivariate logistic regression model to explore predictors for SIP. Due to the possible colinearity of tested variables, we applied a stepwise logistic regression model. All analysis were performed using the SPSS 19.0 software (SPSS inc, Chicago, IL, USA), and a probability value of p<0.05 was considered as statistically significant. Final stepwise logistic regression model to predict SIP In a stepwise logistic regression model including all parameters showed a significant difference between the SIP and NSIP group. In univariate analysis (female, total cholesterol, D2-7 SBP-ARV), total cholesterol (odds ratio [OR]=2.32, 95% confidence interval [CI]=1.46-3.69, p=0.000), and D2-7 SBPARV (OR=5.96, 95% CI=1.56-22.78, p=0.009) remain independent predictors of SIP at day 7 (Table 5). Table 5. Final stepwise logistic regression model to predict SIP. 4 h in the next 7 days). We had continuously collected more blood pressure data in a longer time and it gave us a better chance to reflect the true BPV during the admission time. The reading to reading BPV was more accurate by acquiring more blood pressure data in this study. Furthermore, previous studies were predominantly retrospective researches, which were designed to investigate the prognosis of long-term BPV for hypertensive, previous stroke or TIA patients [15-18]. Very seldom studies had been designed to prospectively explore the relationship between SIP and short term BPV. This study was a prospected study, only focused on the subjects of AIS or TIA patients. At last, we adopted the ARV as the main index of BPV in the present study. Proper selection of the variability index is critical to assessing the value of BPV as a risk factor . There are some defects among them and may not reflect the BPV truthfully and properly, SD and CV ignore the order of blood pressure data; as a result, two subjects with different clinical meaning may have the same SD or CV, wSD ignore the adverse effect of nocturnal decreases in blood pressure, VIM is a statistical tool which calculated complexly and not suitable for clinical application. Compared with them, ARV is an emerging index to represent BPV and it has many merits. First, it takes more consideration of the time series nature of blood pressure values so that may reflect individual BPV more accurately. In addition, it can reflect the correlation between BPV and target organs more reliably to be used for establishing the prognostic significance of BPV. 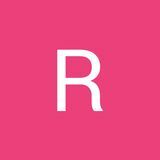 Furthermore, its formula shows simple, easy to be calculated, simple to be used in clinical practice. Several limitations of this study should be noted. Firstly, this is a single-center study, and the results may have limitation on generalization. Secondly, we didn’t measure the potential influence of sub-type of stroke, or the extra and intra cranial artery stenosis which may partly explain the findings. Thirdly, the initial NIHSS score of this cohort was low (NIHSS=4). So our findings may not represent all type of ischemic stroke and only applied in particular to patients with mild stroke. Fourthly, there are nearly 20% of the patients were enrolled to this study at the time of 72 h after onset. For this reason, SIP rate of this study maybe under detected. At last, due to the reasons of limited sample size, BPV ARV was only divided as two groups. If categorize the BPV ARV with more levels, we may have the opportunity to find a linear relationship between increased ARV and SIP rate. Despite of the above limitations, our results suggested that high systolic BPV during the acute phase of IS/TIA may be an independent risk factor for SIP within the initial 7 days after admission, particularly for the patients with mild stroke. This implies that BPV estimated by ARV could be potentially modifiable risk factor for the development of SIP. Further prospected studies with larger sample size are warranted. Tan/Meng/Xing/Zhao/Xu the Natural Science Foundation of Guangdong Province (No. 2014A030310094), the Science and Technology Program of Guangzhou (No.2014Y2-00505 and 201508020004), and the Medical Scientific Research Foundation of Guangdong Province (No. 201512316463467). blood pressure, and episodic hypertension. Lancet 2010; 375: 895-905. 16. Rothwell PM, Howard SC, Dolan E. Effects of beta blockers and calcium-channel blockers on within-individual variability in blood pressure and risk of stroke. Lancet Neurol 2010; 9: 469-480. 17. Rothwell PM. Limitations of the usual blood-pressure hypothesis and importance of variability, instability, and episodic hypertension. Lancet 2010; 375: 938-948. 18. Webb AJ, Fischer U, Mehta Z. Effects of antihypertensivedrug class on interindividual variation in blood pressure and risk of stroke: a systematic review and meta-analysis. Lancet 2010; 375: 906-915. 19. Manning LS, Rothwell PM, Potter JF. Prognostic significance of short-term blood pressure variability in acute stroke: Systematic review. Stroke 2015; 46: 2482-2490. 20. Sacco RL, Kasner SE, Broderick JP. An updated definition of stroke for the 21st century: a statement for healthcare professionals from the American Heart Association/ American Stroke Association. Stroke 2013; 44: 2064-2089. 21. Mena L, Pintos S, Queipo NV. A reliable index for the prognostic significance of blood pressure variability. J Hypertens 2005; 23: 505-511. 22. [No authors listed] 1999 World Health OrganizationInternational Society of Hypertension Guidelines for the Management of Hypertension. Guidelines Subcommittee. J Hypertens 1999; 17: 151-183. 23. Alberti KG, Zimmet PZ. Definition, diagnosis and classification of diabetes mellitus and its complications. Part 1: diagnosis and classification of diabetes mellitus provisional report of a WHO consultation. Diabet Med 1998; 15: 539-553. 24. Wittke E, Fuchs SC, Fuchs FD. Association between different measurements of blood pressure variability by ABP monitoring and ankle-brachial index. BMC Cardiovasc Disord 2010; 10: 55. 25. Kang J, Ko Y, Park JH. Effect of blood pressure on 3month functional outcome in the subacute stage of ischemic stroke. Neurology 2012; 79: 2018-2024. 26. 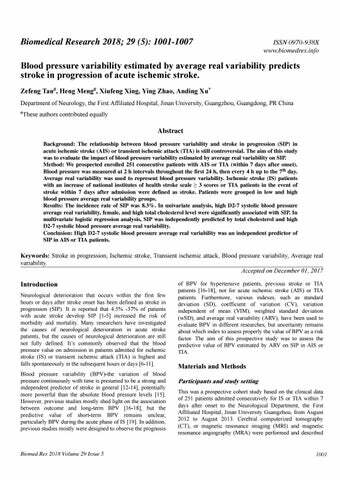 Yong M, Diener HC, Kaste M. Characteristics of blood pressure profiles as predictors of long-term outcome after acute ischemic stroke. Stroke 2005; 36: 2619-2625. 27. Fukuda K, Kai H, Kamouchi M. Day-by-Day Blood Pressure Variability and Functional Outcome After Acute Ischemic Stroke: Fukuoka Stroke Registry. Stroke 2015; 46: 1832-1839. 28. Aslanyan S, Fazekas F, Weir CJ. Effect of blood pressure during the acute period of ischemic stroke on stroke outcome: a tertiary analysis of the GAIN International Trial. Stroke 2003; 34: 2420-2425. 29. Ishitsuka K, Kamouchi M, Hata J. High blood pressure after acute ischemic stroke is associated with poor clinical outcomes: Fukuoka Stroke Registry. Hypertension 2014; 63: 54-60. Relationship between BPV-ARV and stroke 30. Saeed NP, Panerai RB, Horsfield MA. Does stroke subtype and measurement technique influence estimation of cerebral autoregulation in acute ischaemic stroke. Cerebrovasc Dis 2013; 35: 257-261. 31. Saji N, Toba K, Sakurai T. Cerebral small vessel disease and arterial stiffness: tsunami effect in the brain? Pulse (Basel) 2016; 3: 182-189. 32. Delgado-Mederos R, Ribo M, Rovira A. Prognostic significance of blood pressure variability after thrombolysis in acute stroke. Neurology 2008; 71: 552-558. 33. van Sloten TT, Protogerou AD, Henry RM. Association between arterial stiffness, cerebral small vessel disease and cognitive impairment: a systematic review and metaanalysis. Neurosci Biobehav Rev 2015; 53: 121-130. 34. Singer J, Trollor JN, Baune BT. Arterial stiffness, the brain and cognition: a systematic review. Ageing Res Rev 2014; 15: 16-27.